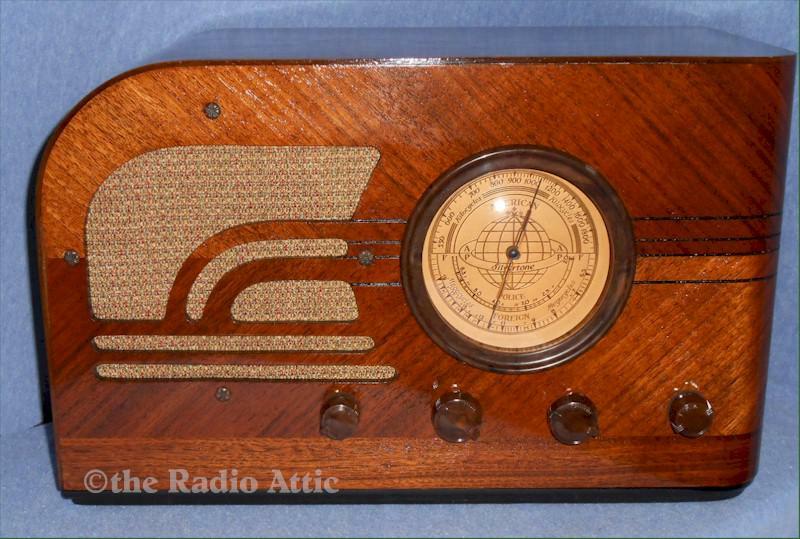 This superb playing tabletop radio is ready for you to proudly display and listen to. An attractive Art Deco waterfall design, it was sold under the Sears & Roebuck brand name "Silvertone" as part of the "Sears Golden Jubilee," which offered a series of radios with different sized gold dials and styles. A six-tube receiver, it covers the broadcast band (550-1850 KC) and has short-wave band coverage (in two bands) up to 19 MC. All three bands work great! Wire antenna is needed (supplied). The cabinet was expertly restored with nitrocellulose lacquer as used originally. The electronics were restored, replacing all old paper and filter capacitors with modern equivalents. All tubes and resistors were tested and weak or bad ones replaced. You would be hard pressed to find a nicer example. Dial is perfect and illuminates for night use. Original Tenite escutcheon around dial is excellent. Original knobs have correct lettering, grille cloth is correct reproduction, original perfect speaker. 90 day warranty applies. Aux input (iPod, CD player, etc.) has been added, and can be used with a Bluetooth receiver to stream tunes to the radio. Weighs 16 pounds, 15-1/2"W x 10"H x 9"D.